Commodore International introduced the machine to the market in 1985, after having bought Amiga Corp. The machine was ahead of its time, sporting a custom chipset with advanced graphics and sound capabilities, and a sophisticated multitasking operating system, now known as AmigaOS. 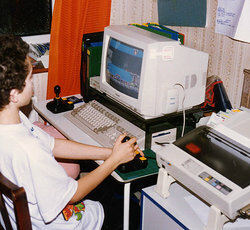 Providing a significant upgrade from 8-bit computers such as the Commodore 64, the Amiga quickly grew in popularity among computer enthusiasts, especially in Europe. It also found a prominent role in the video production business. The Amiga's chipset was designed by a small company called Amiga Corporation during the end of the first home video game boom. Wary of industrial espionage, the chipset was codenamed Lorraine during development. Amiga Corp. funded the development of the Lorraine by manufacturing joysticks while seeking investors. The chipset was to be used in a video game machine, but following the video game crash of 1983, the Lorraine was repurposed to be a personal computer. Before Amiga Corp. could bring the machine to market, the company encountered financial difficulties and was sold to Commodore in August 1984. The first Amiga computer, simply called the Amiga, was released in 1985 by Commodore, who marketed it both as their intended successor to the Commodore 64 and as their competitor against the Atari ST. It was later renamed the Amiga 1000 (or A1000 for short). Revolutionary for its time, it could display 4,096 colors and produce 4 channels of 8-bit digital audio. It is also notable for having the first preemptive multitasking operating system with a color GUI, allowing users to perform multiple tasks at the same time. 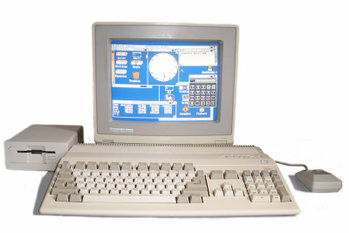 In 1987, Commodore released two new Amiga models, the A500 and the A2000. These were marketed as low-end and high-end machines, respectively. The former became the most popular Amiga computer of the decade and served primarily as a games machine, while the latter was marketed as a more serious workstation for graphic purposes, due to the presence of a SCSI controller option, a Genlock slot and a video I/O connector. In 1990, the A3000 was introduced as the successor to both the A1000 and A2000, with an extended chipset (ECS) and the second release of its operating system, which would eventually be called AmigaOS. In the same year, Commodore released three new low-end machines: the CDTV, aimed to move the platform to the living room; the A500+, with the same enhancements as the A3000; and the A600, basically an A500+ in a smaller box with an IDE controller for hard disks. All of these were commercial failures, mainly due to poor marketing. Mass-market Amigas were then considerably cheaper than PCs and Macs at the time. This factor helped to boost sales in the more price-conscious European markets, but it also led to Commodore being viewed in U.S. markets as a producer of cheap "game machines". This perception was furthered by the fact that most Commodore retail outlets were toy stores, and marketing campaigns were woefully mismatched with the status-conscious American public. Overall, the Amiga was very successful in Europe, but it sold less than a million units in the U.S.. In 1992, Commodore released their last Amiga computer models, the A1200 and the A4000: Each featured the new AGA chipset and the third release of AmigaOS. In 1993, menaced by console giants Sega and Nintendo, Commodore marketed the CD32 in a desperate attempt to save their business. The CD32 was one of the earliest CD-based consoles and was also the world's first 32-bit game machine, with specifications similar to the A1200. In 1994, Commodore filed for bankruptcy and its assets were purchased by Escom, a German PC manufacturer, who in turn went bankrupt in 1997. The Amiga brand was then sold to another PC manufacturer, Gateway 2000, which had announced grand plans for it. However, in 2000, Gateway dropped the Amiga brand. This is rumored to be due to pressure by Microsoft; however, the real reason for the sale is unknown. The current owner of the trademark, Amiga, Inc., has licensed the rights to make hardware using the Amiga brand to a U.K. computer vendor, Eyetech Group, Ltd, which was founded by some former UK employees of Commodore International. They are currently selling the AmigaOne via an international dealer network. The AmigaOne is a PowerPC computer designed to run the last remnants of AmigaOS, which was itself licensed to a Belgian-German company, Hyperion Entertainment. Only a very few Amiga clones were ever produced, as both Commodore and subsequent owners of the trademark refused to license the Amiga technology to third-party manufacturers. Today, Amigas running AmigaOS version 3.9 and earlier are now considered "Classic" Amigas, as opposed to the new Amiga Inc./Eyetech/Hyperion models. Due to its popularity as a gaming platform, many people incorrectly refer to the Amiga as a games console (even though it is a fully-featured computer). However, there are many "Classic" Amigas still in use around the world. A popular use for the classic Amiga is as an automated readerboard for local community-access TV stations. For its time, the Amiga was quite an advanced computer for the home market. It provided impressive sound and graphics for games, and it was also popular in business environments until around the mid-1990s, aiding users in video editing and 3D graphics. The very first model, the Amiga 1000, had a 7.16MHz CPU, designed to work directly with NTSC video. The CPU clock frequency was precisely double the 3.58MHz color carrier frequency. The A1000 had a built-in composite video output, which allowed the computer to be hooked up directly to a TV or VCR. However, the output signal was considered too "hot" (strong) by many to be useful for anything other than home use (however, this could be remedied by running the A1000's composite output through a video processing amplifier, or "proc amp", to bring the video levels down to a suitable amount).